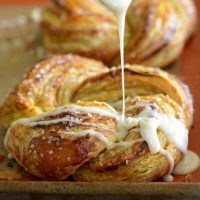 Pumpkin Twists: flaky puff pastry is filled with a spiced pumpkin filling, baked until golden brown, and then drizzled with a sweet vanilla glaze on top! It’s time for another pumpkin recipe and a new video! Y’all are gonna love these Pumpkin Twists and I promise they are not difficult to make. Just watch the video and tell me you don’t want to eat 500 of them immediately! I had a bunch of puff pastry laying around in my freezer just begging to be used. Doesn’t your puff pastry talk to you too? No, just me? Weird. I should probably lay off the caffeine. Anyways, I was going back and forth between making my favorite Lemon Danish or Sweet Almond Pastry. However, I really wanted something more fitting to the Fall season I am currently pretending to live in…stupid Florida. After I pulled these gorgeous Pumpkin Twists out of the oven, I decided they needed a sweet vanilla glaze drizzled on top. It turned them into some kind of flaky puff pastry pumpkin donut deliciousness. In other words…HEAVEN. Just looking at that photo has me wanting to make these again for breakfast tomorrow morning. 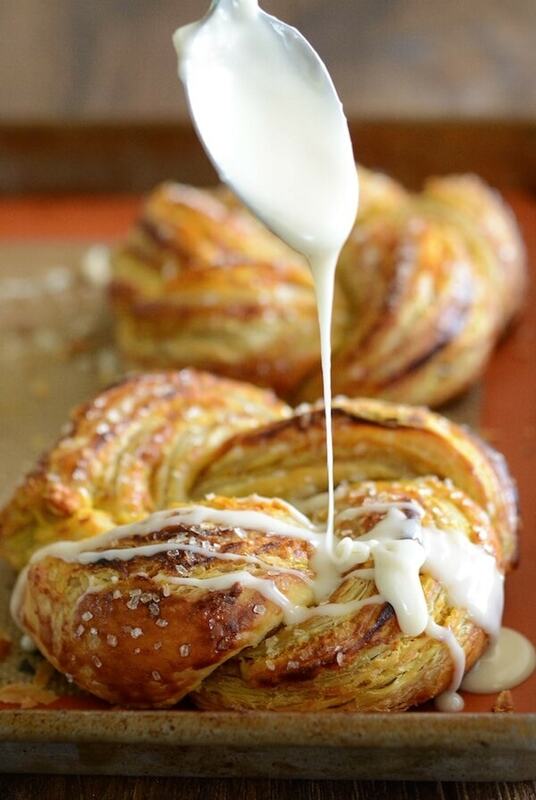 Just look at those crispy buttery layers with spiced sweet pumpkin swirled throughout!! These may seem a little intimidating to look at, but I promise they are very easy to make. Just watch the video at the top of the post to see how simple they are to make. You can whip them up in just a few minutes of work and everyone will think you are some kind of pastry master! You could make these with sweet potatoes for a different spin if you aren’t feeling the pumpkin. Also, I think they would be wonderful with a maple icing instead. Just add a little splash of maple extract to the icing! Preheat oven to 400°F. Line a baking sheet with parchment paper, set aside. In a small bowl, whisk together egg and water, set aside. In a large bowl, whisk together pumpkin, sugar and pumpkin pie spice. Follow video above for how to cut, fill and braid pastry. Here are some written directions to try to help guide you, but it's much easier to watch the process in the video. Divide pumpkin mixture evenly on each piece of puff pastry. Spread pumpkin into an even layer. Starting at one end, roll the pastry over the pumpkin mixture. Using a sharp knife, slice the center but leave 1 inch at the top of the pastry connected. Twist the two pieces together, making sure to keep the pumpkin filling sides facing up. 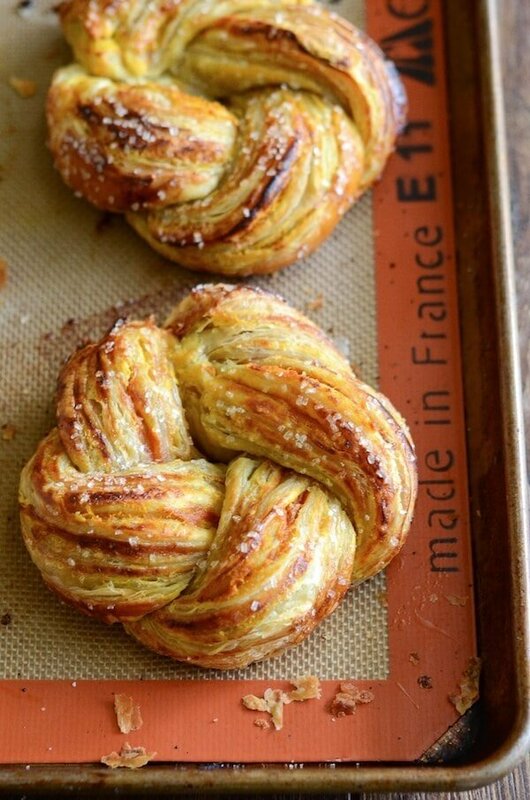 Form the pastry into a circle by pulling the two ends together and pressing together. Place pastry on prepared baking sheet leaving room for spreading. Continue until all pieces of puff pastry have been completed. Brush the pastries lightly with the egg wash you made earlier (the egg and water). Sprinkle with coarse sugar. Bake for 30-35 minutes, or until golden brown. Remove from oven and let cool for 10 minutes. In a small bowl, whisk together powdered sugar, milk and vanilla extract. 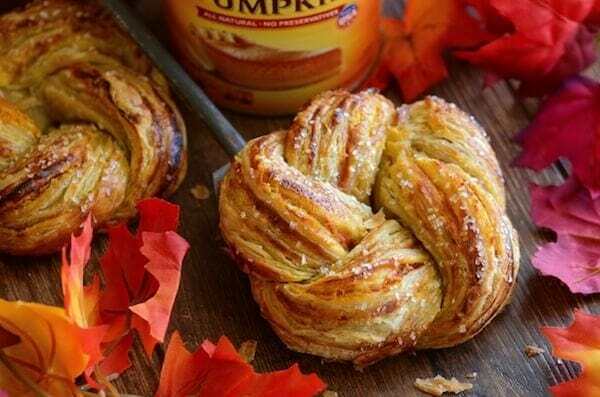 Drizzle on top of warm baked pumpkin twists and serve! OMG! I wish you had MORE pix because I’m so in love with these! I could look at them all day (although I’d prefer to eat them)! Just gorgeous and great with the pumpkin! 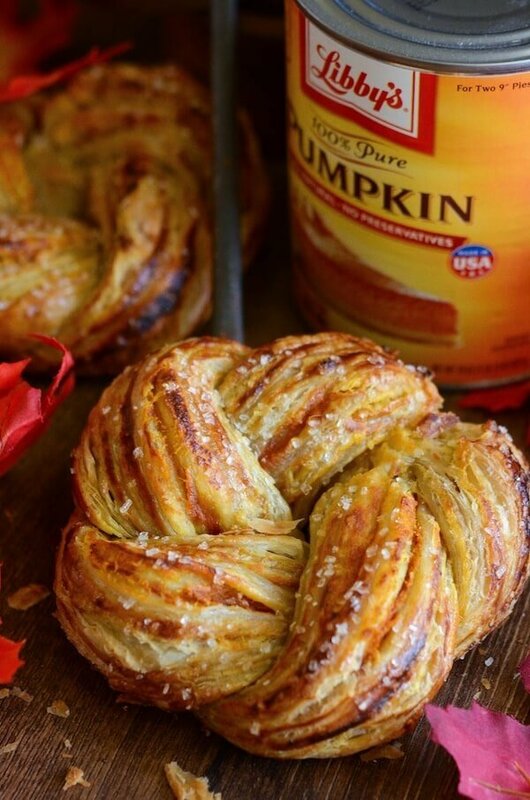 These twists are so pretty to look at and I’ll bet all of that pumpkin-y goodness makes them taste even better! Lol don’t they though , but I want to make my cream cheese drizzle n pour it on top omg lol that would be so amazing with these . Yes, cream cheese frosting, I was just thinking that! These are so pretty! Mine probably wouldn’t turn out half and beautiful as yours. At least they would taste good. Umm, yes please!! These look amazing! Great video as well! Oh my goodness! YES, I want 500 of them immediately!! I definitely want 500 of these! Love these! Just made them for my family. They are amazing! Me too! Tried two different variations and middle was raw both times! What size is the puff pastry sheets? Could you use Apple filling ? Standard size – 10 inches by 15 inches. I use Pepperidge Farm store bought. Yes, you can use any filing you would like! My sheets are not 10″ X 15″. I bought Pepperidge Farm. It’s only 9 X 9. Do you roll them to that size? These look wonderful! I think they’d be good using spiced apple sauce as well. Do these keep? How long in an air tight container? Do they freeze? I didn’t see a reply to the earlier post. In an air tight container for up to 3 days. I have not tried freezing them myself. I really wanted to love these. They look pretty, but way too much “bread” or pastry compared to filling ratio. You can’t fill with a lot of filling because it will squish out, causing the pastry to be the overpowering ingredient and taste you get when eating. This is a suggestion for working around your filling-to-dough problem. Where I come from pumpkin pie is done a little differently. It’s more like strudel using filo dough or puff pastry(whichever you prefer). Instead of using pureed processed pumpkin, we grate raw pumpkin(a butternut squash works great for this), mix it with spices and a little sugar and then roll it up in dough the same way one would do with a rolled apple pie or baklava. This cuts down on the moisture significantly and also has more fiber. It also doesn’t have any of the extra fattening components aside from the dough that normal American-style pumpkin pastries are known to have. I hope this helps. These were beautiful and tasty….except for the inside which never fully cooked and remained raw! I baked them for nearly 30 extra minutes with no better result!? Any suggestions? I made these as well and followed the steps bake them for 30 m just like the instructions said and the inside was raw, did a second batch baked for 45 m still came out raw, the outside looks perfect but not the inside… Waste of money.. could not serve it raw…. I made these also and the inside was raw. I’m wondering if I make them smaller if they will cook all the way through. Yep me too the insides totally inedible becauseit would never cook! The basic idea is ok but I would do a differentshape next time. The twist thing is just a bad idea. There’s no way it can cook evenly. I made mine very large – so one sheet of puff pastry per twist. However, you can use the same method on a smaller sheet of puff pastry and make a more normal sized pumpkin twist. So you could cut one sheet of puff pastry in half and make two, or in fourths and make four. It’s up to you! 🙂 Just keep in mind that they wont take as long to bake if you make them smaller in size. Where do I find the puff pastry sheets??? with the croissant rolls etc???? does it say “puff pastry sheet” on the can?? and lastly does one can make one pastry??? I found them by the pre-made pies and it does say puff pastry on the box. In other responses she says one sheet=one pastry; you can cut them in half to make smaller ones. Can’t wait to try these! Is the egg wash necessary or could it be substituted? One family member has an egg allergy. It gives them a nice shine. And helps the sugar stick. You could use melted butter or milk if either one of those is ok for your family member. Hi! I was so in love with these I tried them tonight but no matter how long I baked them the inside was still raw. Do they take time to “set up” after baking? I only made two since there was only two sheets ina box. Any tips? Thx! I agree. They look beautiful and everyone wants to try them, however, not so impressed when you do. Not worth the cost of puff pastry. Any luck figuring out how to get them to bake all the way through ? I tried these a few times. You have two choices if you want it to cook right. 1. Braid the dough but don’t wrap into circle. 2. After cutting, don’t braid it. Just wrap into circle like a doughnut. Both ways cooked through and looked pretty. I’d love to try these but… can’t find the video anywhere. Am I missing something? Click on the very first picture. Completely raw… I divided my sheet to make 2.. have flipped them and poked holes through them to cook through.. it’s been over an hour and still raw dough. Made these for my family. They turned out so good, great recipe! I could use a little practice getting the circle to stay connected during bake, yours are beautiful. I made these exactly as recipe and video show, but they turned out raw in middle and perfect on outside. I thought flavor was just ok. I made them a second time and added cinnamon to pumpkin and it was so much better. I also didn’t braid the dough, I just cut it and placed on a circle, it turned out perfect with this minor change and looked just as pretty. The PragerU ad before the video instruction was hard to watch. The apparent need of it’s authors to correct the record on the history of Thanksgiving, at the very least ignores a central critique of the holiday – nothing short of genocide followed the arrival of white settlers, whatever happened or didn’t happen at that Thanksgiving event. Disease, yes. But also brazen conquest in the name of faith or manifest destiny subjugated an entire continent, an entire hemisphere, of people. I give thanks with my family during this holiday, but not in honor of early white settlers. However innocent some may have been, the resulting massacre of peoples is far more significant. Remembering a friendly interaction with Native Americans at the level of a national holiday when there is no national holiday remembering their unimaginable loss doesn’t sit right with me. Geez, okay, we get it. Hi Jessica – I agree with everyone that this is a stunning recipe. But I’m curious why you would post a recipe in which the method of baking is not successful (raw in the middle). Does yours get done in the middle? I don’t see the video ? I cannot even express the amount of disappointment I had with this recipe. First off, I’m a well seasoned baker. I hesitated immediately when I read it was an entire sheet of puff pastry. Being as while puff pastry is light and airy it still has loads of butter in it. Similar to a crossaint. Filling it, twisting and putting it together concerned me to say the least about wether this would cook thoroughly or not. Needless to say, it did not. I’m writing this as it’s sat in my professional grade oven going on 45 minutes now. The other thing with puff pastry is as it heats it flattens and then puffs. The photos you’ve posted are not accurate to the recipe. Yes, they can come out in that shape but there is absolutely no way they are that small. I love the concept. I should have went with my gut instincts and cut the pastry in 1/3 and gotten 3 out of each. They’d be more accurate to the photos represented above and a proper bake can be then achieved. I’m so glad you posted this. It’s exactly how I feel. It was raw and not much flavor. I too am going to cut the sheet into 4 and try again. I’m also going to just shape into a circle instead of a twist. I love the concept but the results were sub standard. I wonder how some people got good results? Hmmmm. Well, wish me luck. Hi made these and they completely flopped. I put them in for the exact time and they weren’t done at all. Am I missing something because the idea is great. These are wonderful! I baked them for 30 min and they didn’t look quite done. I let them go another 5 and the tops were clearly done. However, they were not baked on the inside. Any hints to being able to tell if the inside is cooked? Thank you! I made these tonight and they turned out wonderful. I didn’t have the issue of the centers not cooking. Not sure why so many are. Maybe their ovens are too hot? ANyways, thanks for the recipe! 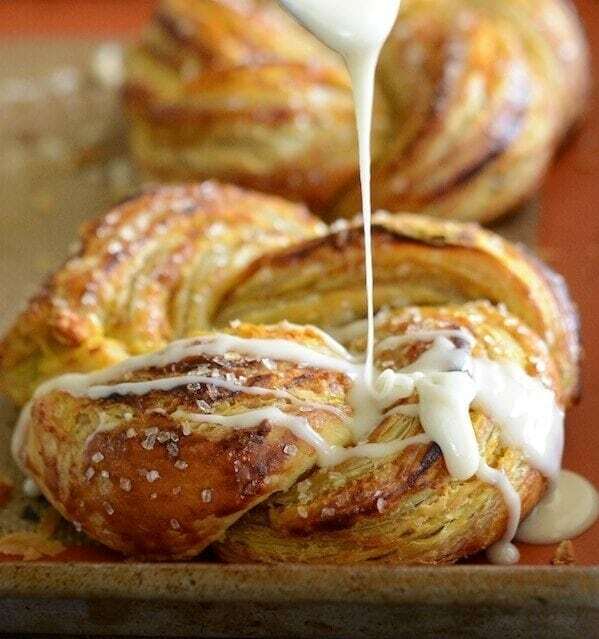 Hello, I want to try this recipe but I want them to look as pretty as yours and i’ve been trying to find the video so I can see how you work the dough but I can’t seem to find it! I can’t find the video. Was it removed? I made these following the recipe and mine did not bake in the middle either. The puff pastry just remains thick and soggy inside. The recipe is flawed and I think to correct the problem it’s best to roll the dough to make it thinner. I want to make the pumpkin twists, sept. 2018. but, i cannot open the video and am perplexed about the instructions. any clues? wanna make it but am afraid i’ll goof it up. help! i cannot even find the video ihttps://healthy.kaiserpermanente.org/health/care/consumer/dis/signoffn the search boxes. everything but. Tried these twice & while they got overcooked on the outside the inside was still uncooked. Looked beautiful but there just seemed to be too much dough–they were bigger than the ones in photo. Maybe next time fewer layers of dough? Any other suggestions? Made my pumpkin treats today. They came out awesome and very tasty. I love them. I’m sorry, maybe I’m blind but I can’t seem to find the video. Can you please tell me how to see it? Thanks! ©2019 The Novice Chef. Design by Purr.